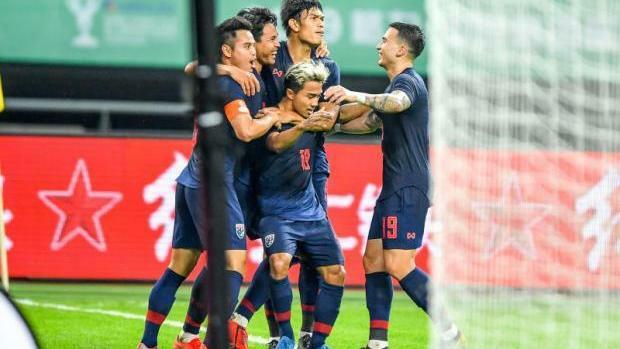 PHUKET: Thailand’s crafty playmaker Chanathip Songkrasin produced a sparkling performance as the War Elephants punched their ticket to the China Cup final, beating the hosts 1-0 on Thursday night (Mar 21). A first-half goal by the Consadole Sapporo midfielder proved enough to help the Thais make amends for two straight losses to Team Dragon in their most recent meetings, including a 2-1 defeat in the Asian Cup last 16 round in January. The victory is likely to boost caretaker coach Sirisak Yodyardthai’s case for a permanent role. However, the same cannot be said about his opposite number – Italy's 2006 World Cup winning star Fabio Cannavaro – who took charge of the Chinese national team for the first time last night in Nanning. The other two countries taking part in the four-team tournament are Uruguay and Uzbekistan, who meet today with the winners facing the War Elephants in the final on Monday (Mar 25). The losing sides will square off in the third-place play-off, also on Monday. Chanathip and fellow J-League-based stars Thitiphan Puangjan and Theerathon Bunmathan kept troubling the Chinese defenders in the first half but the Thais were not sharp enough in front of the goal. Chanathip dribbled his way into the box in the 13th minute but his shot was too feeble to trouble Chinese goalkeeper Yan Junling in any way. China had their moments as well in the first half and Wei Shihao was denied by Thailand goalkeeper Siwarak Tedsungnoen during the first 20 minutes. The Chinese pressured the Thai side but Suphan Thongsong, Nattapol Malapan and Adison Promrak combined effectively at the back to thwart the opponents’ onslaughts. The winner came in the 33rd minute, when striker Adisak Kraisorn passed on the ball to Thitiphan, whose short flick was picked up by Chanathip to guide it into the net. Thailand should have netted their second goal early in the second half but Chanathip was denied for the second time by Yan. The Chinese had a couple of opportunities to level the score, with Dong Xuesheng coming the closest to scoring, heading a Zhang Xizhe cross over the bar. The hosts mounted the pressure as the match progressed but the Thai defenders were up to the task last night. Sirisak packed his defence and it was enough to frustrate the Chinese efforts for the equaliser. The Thais held their ground well and Team Dragon found it difficult to make any real inroads. The loss is likely to add pressure on Cannavaro whose appointment as the Chinese national coach has been widely criticised.